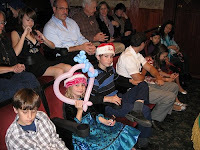 It's becoming somewhat of a tradition that every year Robin takes his local nieces and nephews to the Magic Castle on Children's Day. This year, Aunt Vicky got to go too! My first picture above is our two charges -- Emily and Ryan -- waiting patiently in the front room of the Close-Up Gallery for the show to start. The magician had just gifted Emily with the lovely heart-shaped balloon. Click any picture to see it bigger. This next shot I grabbed in the Hat & Hare room down in the basement -- against the rules, mind you, since no one is supposed to take pictures inside the Magic Castle. But I knew Magic Steve wouldn't mind, so I risked it! 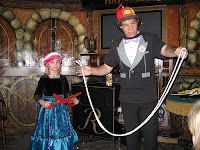 Emily is working hard as the magician's beautiful assistant. 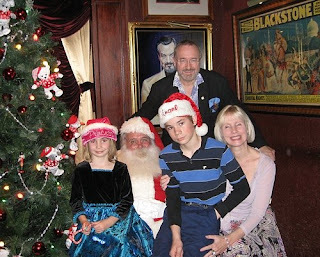 Last but not least, the Magic Castle featured Santa in the Blackstone Room, so we decided to grab a family picture to commemorate the day. I wish I could show you the magnificent orange parrot balloon animal that Denis Forel made for Emily precisely to her specifications, but it suffered irreversible damage before I could get the camera on it. Ballon animal artistry is such a fatally transient art, sigh. Be sure to listen for Emily telling the magician that Ryan is 12 years old.